Stray cats abound on the Greek island Crete, most of them loitering around tavernas hoping for a handout. But Eirwena is one of the lucky few. She lives in Russia, but often travels to Petrokefalo in Crete to visit family. She even has her own blog, http://eirwena.blogspot.com, a collection of conversations between Eirwena and her biped Indy, interspersed with lots of pictures. It's truly one of the funniest cat blog's I've come across, so be sure to check it out. Eirwena will soon have her own book as well. What a lucky and very lovely traveling cat! Eirwena seems happy travelling around seeing the world (unlike we would be!). I have encountered her blog. Oh she is so pretty, I am glad you featured her! Pretty kitty. Have a wonderful Wednesday. 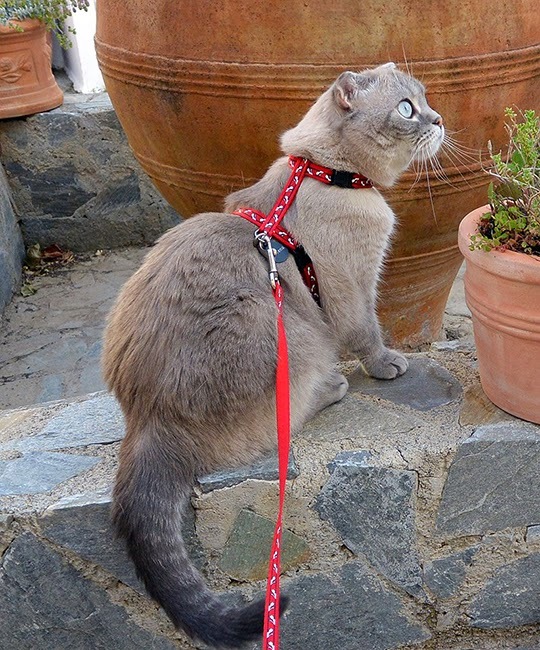 We had two little kittens once upon a time who liked to run into the house every time we brought the groceries home from the store, so I bought leashes to put on them to keep them from coming into the house and they hated that so bad! They tried with all their might to get free, but were unsuccessful. I tried talking soothingly to them to calm them, but that didn't work, so instead I just laughed. It was funny to watch. Nice photos. Thanks for joining my #WW linky party. Have a fototastic week! We're lucky enough to have met a number of travelling pets who holiday with their humans. So lovely to see! That is one intense cat! Will definitely check out Eirwena's blog! She's a true "traveling cat." Oh I have to go check out her tails shes very pretty, glad she has a good home. Eirwena has a beautiful gray coat and beautiful blue eyes. Thanks for linking on Amanda's Books and More! What a beauty is she! 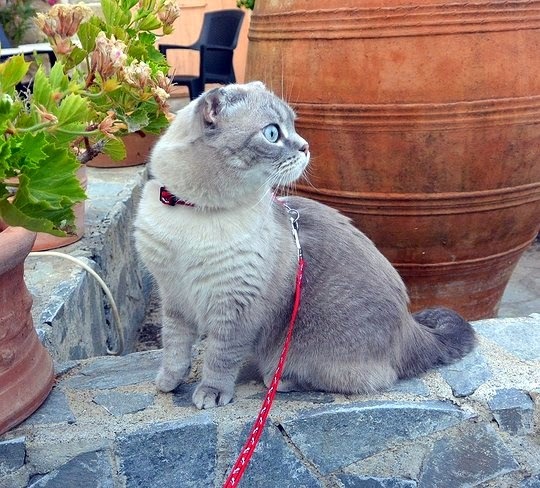 And she is very lucky to travel, have her own blog and purrson who loves her! We will have to stop by. thank you fur haffin' this blog! we are so axcited to see kitties from ofur lands--eirwena is gorgeous, an' we luff travelin' vicariously wif her! an' the halloween kitty post--we can't hardly wait. two of us ARE black cats, after all!! Merci beaucoup Vanessa d'avoir publié les photos d'Eirwena et d'avoir recommandé son blog. Grosses bises et bonne fin de journée. Pretty girl! She looks like a seasoned traveler. C'est photos sont très belles ... comme toi. Merci Nat à Chat :) Ronrons, bises. OH what a beauty! And how dear of her parents to take her. What a truly beautiful cat! Gorgeous cat and photos. 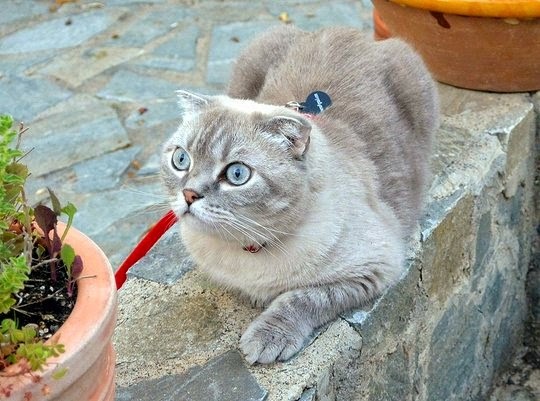 I keep seeing these photos of kitties enjoying the outside on a leash. Sigh. Perhaps one day I'll get used to it. Beautiful cat but she looks a bit startled in that first picture. I remember all the stray cats in Greece, everywhere we went there were dozens of them especially if you were at an outside restaurant table. Eirwena is beautiful! Her eyes are amazing! That cat looks like it's guilty for something and just waiting for karma to strike it back. Beautiful cat she is and lovely pics, we will check out her blog too. wow!!! Those eyes are just stunning! She's adorable! Going to check out her blog now! What a booty! Very purrty! She is exquisite!! I believe I have heard of her before, just precious! And she's a wee beauty too. It's tiny ears are just way too cute. She is adorable. Cats with folded ears always look like they are surprised about something. Nous l'avons reconnu tout de suite ! C'est Eirwena ! Une copinette à nous !